Tool and treatment in one, this age-reversing roller delivers the skin-lifting benefits of micro-needling without the pain of traditional needle rollers that pierce the skin. Pre-filled with lifting serum, the resin needle roller gently glides across your neck and décolleté to quick-start collagen production (skin's supportive structure) and eliminate sagging, crepey skin. Use daily, night preferred. Use on clean, dry skin. Press down on top of tube to pump serum. Roll formula along the neck and decollete 6 times in each direction. Rinse roller with warm water and let dry. Pain-free micro-needling at home. 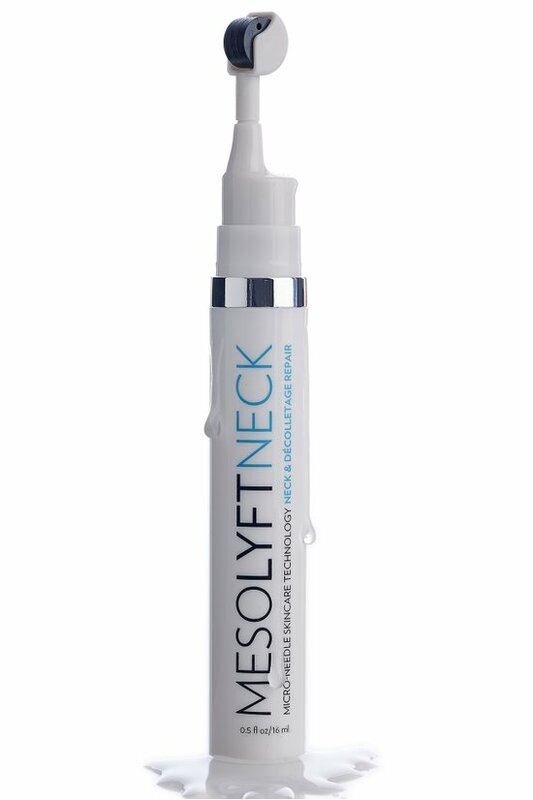 MesoLyft sculpts, brightens and erases wrinkles and dark spots with an easy, all-in-one resin micro-needle roller pre-loaded with chemical-free anti-aging serum. Without piercing or irritating the skin like tradition micro-needle rollers, this gentle resin roller pushes your serum deeper into the skin to stimulate collagen and elastin production (the building blocks of healthy, firm skin) for better, faster results.